Parents ***This is a free version having reduced data set to give preview. Please buy paid version for full content *** Fun filled interactive "Kindergarten Words" app challenges kids to unscramble a word in ~15 seconds by presenting multiple scrambled patterns on a periodic ~3 second intervals. Multiple variants of scrambled patterns for a word engages & encourages kid to recognize intricate word pattern v/s one variant of scrambled pattern seen on physical paper version of such kind of games. Research study shows challenging kids with multiple scrambled patterns even on a same word on periodic successions keeps kids engaged, motivates kids to solve complex scrambled patterns, and also improves the kid's ability to master the words. Fun filled, timed scrambling of words helps your kid to learn and respond in time challenged standardized competitive exams. Familiarity of a large number of words given in "Kindergarten Words" app is critical for fluent reading. These are high frequency words that your child encounters often when reading a text and are must as they build solid vocabulary foundation. Child must memorize these words since they are difficult to sound out. Help your child to say a word if he or she needs it. Find a comfortable place for you and your child to work together. Reward your child for a job well done and give plenty of encouragement. Reinforce the learning by re-running the app. 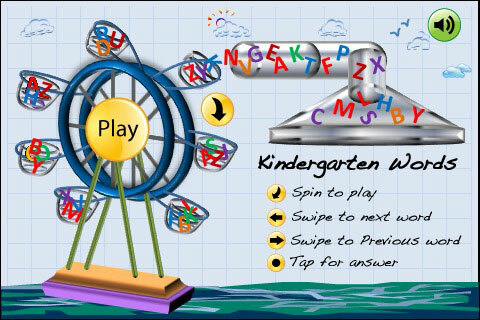 The "Kindergarten Words" app teaches word spellings for ages 5-6 years, in a fun filled animated fashion. An animated ferris wheel carries alphabets and transports them through a funnel, which is fun to watch. The game compels a kid to guess words that are scrambled. Contains Dolch words (50 - 70 % of all words used in school/Library books) and high frequency words that a preschooler should be able to spell. The word list is made up of pronouns, adjectives, adverbs, prepositions, conjunctions and verbs that are relevant to a preschooler. These words will lay the foundation for a lifetime of reading. This fun game will keep children occupied at restaurants, on long trips, while also teaching them how to spell. + Sit with your kid. Initially play and show the app to the kid. + Show the kid features of spinning the wheel, swipe to next and previous word and the tap feature. + Encourage and pursuade kid to guess the scrambled word while aphabets are falling. + Appreciate the kid if he/she comes up an alternate word than what is shown. + Encourage the kid to continue to play and complement him/her for a job well done. + Use the word shown in a sentence (family, home context) for kid to remember the usage. + Use synonyms and antonyms to explain the meaning of the word. + Ask the kid to spell the word without looking at the screen. + Repeat the game at least once a week for few minutes to memorize the spelling of the words. The app uses bright kid-centric colors and animations. The user interface design is based on Human Computer Interface Design Patterns. If you want us to add new features that would help kid in learning please send us an email.